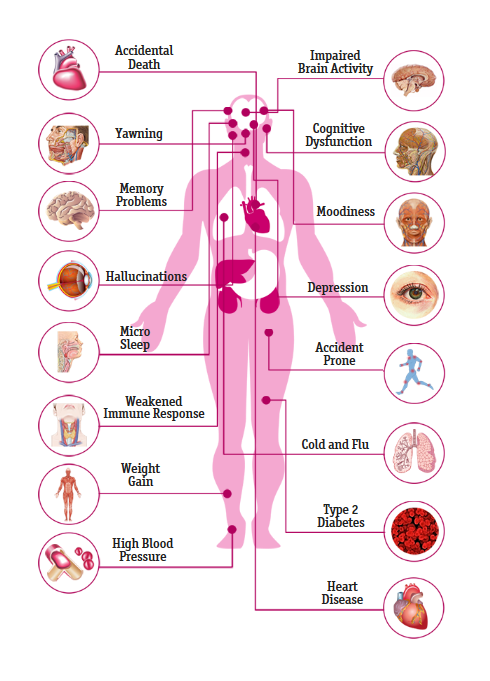 Sleep deprivation can cause damage to your body in the short term. Over time, it can lead to chronic health problems and negatively impact your quality of life. You need sleep as much as you need to breathe and eat. While you’re sleeping, your body is busy tending to your physical and mental health and getting you ready for another day. In children and adolescents, hormones that promote growth are released during sleep. These hormones help build muscle mass, as well as make repairs to cells and tissues. Sleep is vital to development during puberty. When you’re deprived of sleep, your brain can’t function properly, affecting your cognitive abilities and emotional state. If it continues long enough, it can lower your body’s defenses, putting you at risk of developing chronic illness. The more obvious signs of sleep deprivation are excessive sleepiness, yawning, and irritability. Chronic sleep deprivation can interfere with balance, coordination, and decision-making abilities. You’re at risk falling asleep during the day, even if you fight it. Stimulants like caffeine are not able to override your body’s profound need for sleep. When you’re sleep deprived, the effects of alcohol consumption are magnified, as is your risk of being involved in an accident. According to Harvard Medical School, studies show that sleeping less than five hours a night increases the risk of death from all causes by about 15 percent. Sleep deprivation is dangerous to your mental and physical health and can dramatically lower your quality of life.